For many children, a trip to Grandma’s house is something they find dull. So you need to change this by making your place more exciting for your grandkids. I go all out to make sure my home is prepared for their stay. The idea being that they’ll have a much better time. This will make it more likely that they will want to spend time with you again. So you need to make sure you do this as well. You’ll need to come up with plenty of ideas to keep the grandkids entertained. One of the best ways to do this is to stick on a movie. Speak to mum and dad and find out what the children’s favourite movies are. They might even bring them with them when they come to stay. So make sure you have a DVD player to play the movies. In addition to movies, you need to have a good selection of games. I try to dig out as many classic board games as I can. These are a fun and educational way to keep the children entertained. We often play for hours and have a great time together. You might also think about things like models to keep the kids occupied. The idea is to generate excitement when they come and stay. They will need constant stimulation, so make sure you provide a selection of entertainment. One thing you’re going to need to take the time to sort when the grandkids come is the bedroom. Now, how you set the room up will largely depend on the age of the kids. If there is a toddler or infant in the mix, you’ll need to take a look at a cot bed at Cuckooland. With older children, a regular bed will be sufficient. I always take the time to think hard about the sleeping arrangements. When the kids are staying away from home many of them can get upset. Don’t take it personally; they just don’t like being away from mum and dad. However, there may be certain procedures or rituals that always have to happen. I always make sure I speak to mum and dad and find out if I need to do anything for the grandkids to make the stay more enjoyable. It’s always useful to have advice and suggestions from the parents to work on. We all know what children can be like when it comes to food. Many of them are fussy eaters, and they may not want to try anything new. I love to cook for all kinds of people, including the grandkids. But often their tastes and palates change on a regular basis. So I’ve stopped experimenting with new stuff for them to try. Nowadays I like to stick to making their favourite kinds of food. This way I know there will be no problems with getting them to eat it all. If you’re unsure about what their favourite foods are consult mum and dad! If you want your grandkids to come over for repeat visits, they’re going to have to have a good time. Make sure you make your place as kid-friendly as possible. The idea is to turn your place into a home away from home. Somewhere the children can relax, unwind, and have a great time. .... and why you should consider trying this new trend. A box of aqua colour pencils lay strewn across my table along with assorted felt-tips, brushes and sponges. My focus was centred on the open pages of artwork and I hardly noticed the door opening until my daughter stood beside me. "So... what's this?" she asked. She picked up a couple of my doodles with interest. I presented the open passage of my Bible and the illustrated key verse I was working on in my journaling Bible. "I've just started this Bible art journaling.. it's pretty absorbing, once you start. I'm planning this as a heritage Bible to hand down to my kids and grandkids." "Great idea!" she commented. "I really hope I get this one." It's not a new phenomenon to spend time in Bible reading, praying and developing the spiritual habit of journaling. But it's a valuable exercise and one that can impact generations if you begin a journaling Bible that can be passed on to your children or grandchildren.In fact, I wrote about this in a previous article. But recently, Bible journaling has developed into a more succinct, visual presentation of faith. Some have referred to it as illustrated faith, devotions in the margins or simply, Bible Art Journaling. And it's a trend that continues to grow in popularity. And, in itself, this isn't new either. After all, beautiful examples of calligraphy and illumination of Bible passages can be found in museums and arts collections throughout the world. If you have previously considered starting a Journal Bible as a family heritage to hand down to your family, then this art journaling may be something to consider including. If you're like me, though, you're probably feeling a little inadequate. After all, there are so many beautiful, and inspirational, examples on Pinterest. Check out some here to see what others have been doing. Follow New Chapter's board Bible art journaling on Pinterest. If you're uncertain of how you'll begin, try this approach. Karla Smallwood-Dornacher produces beautiful Bible bookmarks and some of her artwork is free. I bought some of her designs (they're not expensive) and slipped them under the page in my Bible. Then I traced the design and just coloured it in. My granddaughter had no trouble doing this, either. In fact, her design was better than mine. I've created and included a very simple version for you to try. You'll find it below this article. Homegrown Hospitality.... You'll find so many different ideas and different techniques when you visit these blogs, so I hope you'll be truly inspired. A great way to begin is just with lettering. You can use lettering templates or trace the wording. Check out this design from Erin Bassett as a good starting point and then branch out with your own ideas. This is a great way to start if you're not sure just what to work on or lack inspiration. Erin Leigh offers 31 days of Bible journaling challenge filled with samples, ideas and helpful suggestions. You can find more information here on her site. Some have asked whether the pens/paints bleed through the page?? They can, a little. The image below shows the reverse of a completed design. I've recently used these pens, Faber Castell PITT artist pen with a brush nib, and they have been great. But even if your design does show a little on the reverse, there is a solution. In summary: You'll find Bible Art Journaling is easier than you imagine with these simple ideas to get you started. Begin your Bible Journal today as a wonderful heritage Bible for your children and grandchildren. Download and print the bookmark below as simple design for your first project. Check out the Bible Art Journaling board on PInterest for more inspiration. Is your house boring? If the answer is yes, today’s handy guide is for you! I know that everyone has their unique ways to style their homes. There’s nothing written that says we must all conform to a particular style. At least, not when you’re a homeowner! By now, you are perhaps struggling to come up with ideas to improve the aesthetics of your humble abode. It’s not an easy task, conjuring up redecoration ideas. Nor is it one when you can’t find someone to help you make it happen! Most of the time, we tend to make the outside of our houses similar to neighbouring properties. But, if you want to differ from the norm, why not try something different? Once on my travels to the city of Oxford, I came across a house with a shark on the roof! Last time I checked, the somewhat controversial house was owned by a BBC Radio Oxford presenter. Obviously such a modification is somewhat extreme, but it just proves that you can make your home stand out from the rest! When you’re stuck at home on a cold rainy day, TV and the Internet can only stave off boredom for so long. If you don’t want to venture out in such miserable weather, what else is there to do? Well, you could play a fun game of ping pong with one of your housemates! But, what happens if your home isn’t big enough for a ping pong table? Simple: you repurpose your living room door! It’s easy enough to put the middle of the door on hinges so you can flip it horizontally. It’s also got the added benefit of being an extra table or desk to use in your home, for those times you need a flat surface to write a letter. Have you ever watched the programme “The Crystal Maze”? If so, you’ll remember there are lots of themed “rooms” in that game show. You could create a themed bathroom. More specifically, you could give it an aquatic theme! You could put sea life murals on the wall. Maybe even a lino floor with an ocean view, if you wanted! I’ve known some people to install computer games in their bathrooms so they can play fishing simulators. Trust me; there are all kinds of funny things people do in the bathroom! If you’re a train geek, one of the wackiest things you could do is convert your bedroom to resemble the interior of a train carriage! I once saw a website where a guy even fitted electric sliding doors in place of the traditional wood door to his train-themed bedroom. For extra bonus points, use genuine train carriage furniture in your bedroom. If you’re a fan of the London Underground, for example, you can even buy the fabric patterns used on past trains! When my grandkids were little, and I still have some who are, we could take long walks outside in the sunshine and search for ladybeetles and grasshoppers. We'd watch the busy ants at work and laugh at the nosey magpie who always follows us around and wants to know what we are doing. But, sadly, kids don't remain content with hunting for beetles. They grow up and their interests certainly change, though perhaps not their interest in cupcakes and scones. It's harder to connect with your older grandkids and build fun memories. So.. how do you entertain older grandkids and generate a level of excitement and anticipation when they visit with you? Fortunately, I have discovered Clip Circuit Electro Lab from Heebie Jeebies. Have you seen it? It's a wonderful kit that contains colour-coded, numbered components that clip together to make various electronic projects- a light with an on/off switch, a buzzer, a fan and more. The manual that accompanies the kit provides step by step instructions to complete each project. Each piece also contains graphics that help kids learn about electric currents and more while working on each project. There is a basic kit as well as larger kits to complete more advanced projects with additional components. Everything needed to build each project in the manual is included in the kits. Yep...it's lot's of fun and not just for the boys. You'd be surprised how much the girls enjoy clipping the components together to create a light or a buzzer, too. It worked out especially well with my grandson. He was studying electricity at school so this fun activity was also educational and reinforced his schoolwork. So, build some fun memories with your older grandkids. Invest in a kit yourself and I'm sure you and your grandkids will really enjoy these activities together. Where will you find Clip Circuits Electro Labs? I was able to pick up a kit at the Puzzling Store. Australian Geographic also stocks them. See here. ..... and why Funky Giraffe is a name you need to know. Has it happened to you? You've fed your little ones, dressed them quickly but with care. Yes.. they're looking good.. grabbed your keys plus the overstuffed bag of essential baby needs...picked up the stuffed toy that had fallen out.. added a bottle of water... popped in a couple of extra snacks 'just in case'....stopped to answer the phone.....ahh, ready. But by then, it's too late. Baby or teething-toddler drool has created a soggy, unsightly patch on their previously spotless top. Yep, babies drool- a lot. If you're a mum, a grandparent, a carer for little ones you experience it daily- the ongoing frustration of trying to keep them clean and dry. And, if your child suffers sensitive skin or eczema, it's even worse. So, maybe you're looking for super-soft absorbent bibs.. in which case, Funky Giraffe will soon become your best friend. And, Funky Giraffe is now in Australia. When I first opened my pack from Funky Giraffe, I was surprised how soft these bibs felt, especially the bamboo fabric. I actually went back to their site to read up a bit about the bamboo and found this: ' Bamboo is becoming very popular due to its inherent eco qualities and also because it is an excellent fabric to use if your baby has eczema or other skin conditions, since it a very breathable, anti bacterial and hypoallergenic material. PS it also feels so luxurious! It really does feel wonderful. In fact, once I popped it around my grandson's neck, he refused to take it off. Oh.. and by the way, the bibs allow for growth with pop fasteners that snap on easily for energetic toddlers who don't want to stop for anything. So, what's the background to Funky Giraffe? Funky Giraffe was founded by a young mother, Yasmin, in England in 2009. Designed to meet a need she was personally experiencing with her young son, Eren, the demand for her range of bibs grew. Her bibs focused on being stylish, practical and affordable and the company has now expanded... to Australia. I found my order was processed and posted very efficiently, but the parcel took a little longer to arrive than I expected. Currently, orders are still sent from England but this will soon change. Funky Giraffe bibs are very different to the traditional baby bib style. They're a fashion item in themselves. Check out the happy little ones from our local playgroup (see main image) who sampled some of the designs. I also found that the Funky Giraffe burb cloths are great to avoid messy finger stains on my lounge. So.. if you'd like to try these good quality, funky designs yourself for your baby or toddler, & you live in Australia, enter below for a chance to win a $50 voucher. Be quick! This giveaway competition is finished, I'm sorry. But you'll continue to find plenty of wonderful fashion bibs for your little ones at Funky Giraffe. Consider including this range of bibs for a Baby Shower gift. While I was trialing and reviewing this range of stylish bibs, I realised that this would be a wonderful collection for a baby shower gift. So... if you're hosting a baby shower and looking for something a bit different but also very helpful, I've added a small Baby Shower invitation below. The file is a powerpoint slide with 2 invitations to a page (A4). It is editable so just download the file, edit the details and print. Then cut the page in half: 2 x A5 sized invitations. 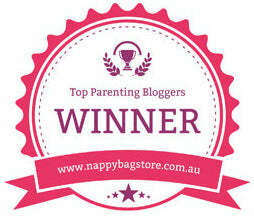 Check this range of bibs out but... enter the Giveaway quickly! Funky Giraffe bibs- good quality, funky designs and great value! Disclosure: This article may include a provided product or affiliate link, at no expense to you. I only review products I am happy to use myself.